Rhodolite Garnet introduction and etymology -Garnet is a gemstone which has more than 10 different colors and all are known by different names, although all Garnets share the same crystal structure. Basically it is divided into two branches based on aluminum and calcium. Pyrope, Almandite, Rhodolite, Malaya and Spessartite are called aluminum Garnets and Uvarovite, Anaradite, Demantoid, Hessonite, Tsavorite are all calcium Garnets. The word ‘Rhodolite’ is derived from the Greek word “rhodon”, which means “rose colored”. Rhodolite is one of the most valuable types of Garnet. Saturation and tone are a very important factor in this stone. It comes in reddish purple to purplish raspberry red color and vivid raspberry-red color being the most valued. The price graph depends on the size of the stone and color and stones over 10 carats are priced high. If we talk about composition and chemical structure of this stone then it is a mixture of two Garnets – Pyrope and Almandine. An inclusion free, vitreous luster and Raspberry Red Color Garnet is the perfect piece of this stone. When we talk about the chemical structure and minerals then scientifically it comes in what is called a Cubic, rhombic dodecahedron structure and the chemical formula is magnesium aluminium silicate. It has 6.5-7.5 hardness on mohs scale, instinctive cleavage and Vitreous luster. Navneet Gems and Minerals has come up with this unique color chart for Rhodolite Garnet because of our customers. They have been very confused since they have been ordering this type of Garnet from different suppliers and getting very mixed colors and variable qualities. We at Navneet Gems and Minerals have a very strict color policy and our selection staff follow this Rhodolite Garnet Color Chart very strongly. 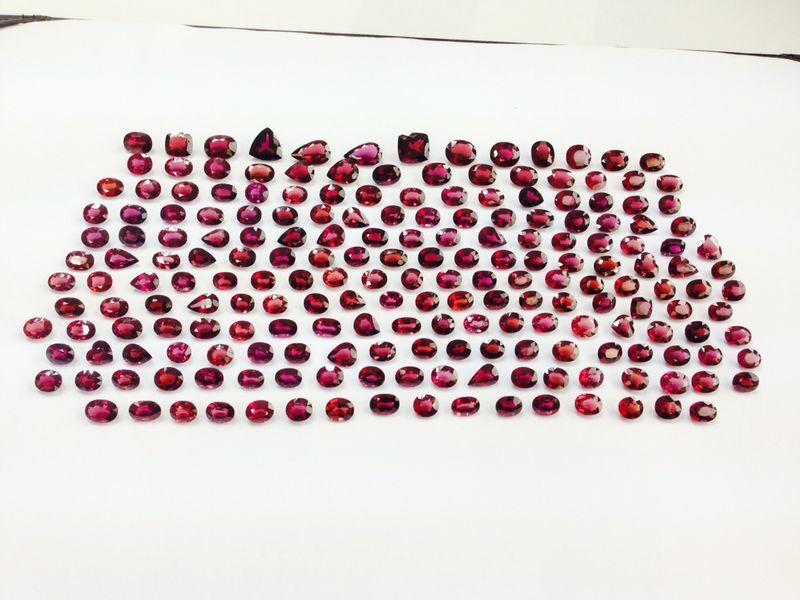 There are so many different colors in Rhodolite that if we had to make a full color chart, then there would more than 15 different shades and thus we came up with a simple version. The last two are Raspberry Rhodolite Garnet which is a pinkish purple shade of Rhodolite Garnet which is the top most stone. But recently the Umbalite have started to show up back in the market with some quantifiable production quantities. Earlier the quantity and the quality most importantly, were very low. We at Navneet Gems and Minerals are able to produce 1,000 pieces of Rhodolite garnet every day. We can produce almost all shapes and sizes from 2 mm rounds up to large freesize stones. Have a look at the different shades, sizes and shapes of Rhodolite Garnets that we can produce at wholesale prices. If you have any price inquiries or would like to source some high end Umbalite Garnets, get in touch with us today! This picture is taken from our stock and all these pieces are cut and finished in our own factory which is here in Bangkok, Thailand. We have many pieces like this lot. Small designers to big jewelry companies all are using this stone in bracelets, pendants, necklaces and rings. For metal, they are using silver and gold in their designs. To minimize the total cost of jewelry pieces, they are using White Topaz, Smoky Quartz, Amethyst and other gemstones. You name it, from “red carpet” events to engagement rings, Rhodolites have been continually used all around the world. Jewelry companies are using small sizes from 1.5mm to 3mm mainly in rings and in the center they are using green color stones. Mainly our customers are from the United States, Europe, Australia and Canada. Some of them are jewelry designers and collectors and users and some big jewelry companies. 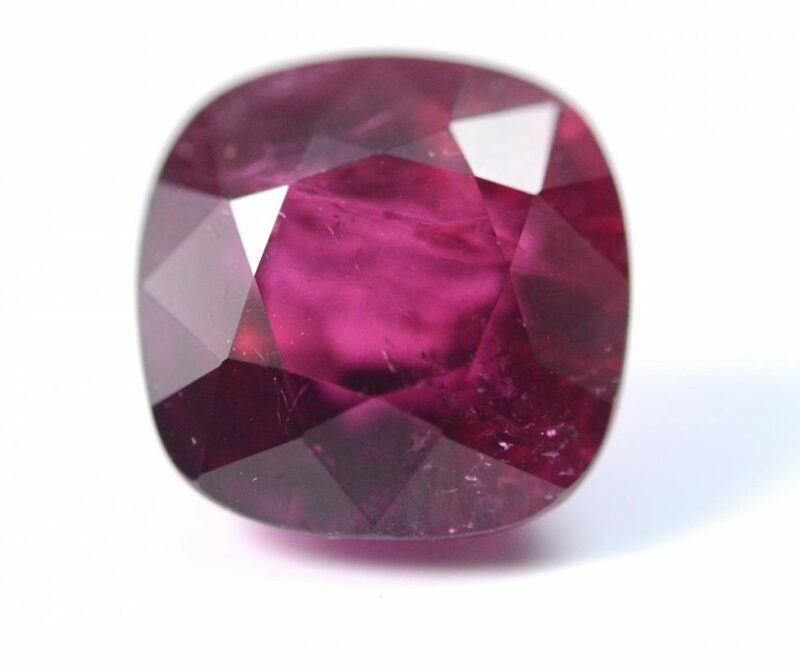 We specialize in big sizes of Rhodolites, over 6 carats in ovals, rounds, pear, octagon, heart and other shapes. We have AA to AAA grade in this stone. As mentioned above about small size designs and uses, due to regular demands of micro size, we always keep them in stock and take only a few hours to ship to our customers. 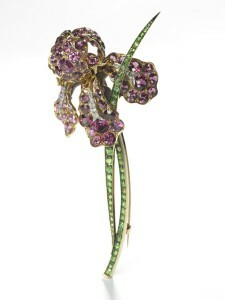 An Iris Brooch designed by Tiffany and Co designer Paulding Farnham to gift his wife, by using Demantoid Garnet, Rhodolite and Diamonds. Rhodolite Garnet gemstones’ hardness is good so it is not delicate like other soft stones but still proper care is important. Proper care includes to protect it from hard blows, which can damage the Garnet Stones. As usual, our experts’ suggestion is to use soapy water and a soft cloth to clean the stone, and be sure to rinse well also, to remove soapy residue. Make sure when you use the brush to remove sticky particles then you don’t use a metal one that can scratch your stone. Other chemicals and ultrasonic cleaners are high prohibited. When you buy Garnet Gemstones Jewelry then make sure to keep the stones separate, in big sizes especially. You can send us an Inquiry through our Contact Us form or find our email address through the link at the top in the right hand side of the banner. We will reply back to you with pictures, prices and other info promptly. We focus on pictures so that we can show to our customers exactly what they are going to receive from us. We are not like other wholesale gemstone suppliers who keep their customers in the dark and after receiving the goods their customers loose money. We keep everything transparent with our customers and inform them prior to delivery. © 2014 Navneetgems.com all rights reserved.